Two embroidery files for the "Spooky Spider" projects, as seen in the fall 2014 issue of Quilting Celebrations. The mini mat is 7.75 x 7.75" and you must have a hoop that's at least 8 x 8" to stitch it. The spider web is part of the digitized embroidery. The spider is done in a fill stitch. 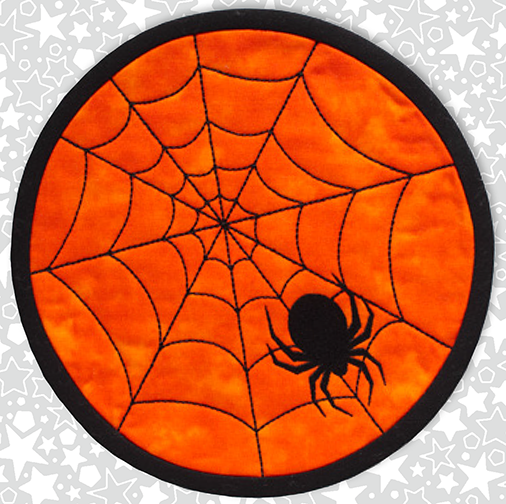 The bonus larger spider is a stand-alone applique and can be used to create the placemat project in the magazine. There is no spider web in this file. The mini mat is quilted in the hoop, in the same we we make all of our our mini mats. You can see our tutorial for those, here.